A carbon offset is a reduction in emissions of carbon dioxide or greenhouse gases made in order to compensate for or to offset an emission made elsewhere. Carbon offsets are measured in metric tons of carbon dioxide-equivalent (CO2e) and may represent six primary categories of greenhouse gases. One carbon offset represents the reduction of one metric ton of carbon dioxide or its equivalent in other greenhouse gases. There are two markets for carbon offsets. In the larger, compliance market, companies, governments, or other entities buy carbon offsets in order to comply with caps on the total amount of carbon dioxide they are allowed to emit. This market exists in order to achieve compliance with obligations of Annex 1 Parties under the Kyoto Protocol, and of liable entities under the EU Emissions Trading Scheme. In 2006, about $5.5 billion of carbon offsets were purchased in the compliance market, representing about 1.6 billion metric tons of CO2e reductions. In the much smaller, voluntary market, individuals, companies, or governments purchase carbon offsets to mitigate their own greenhouse gas emissions from transportation, electricity use, and other sources. For example, an individual might purchase carbon offsets to compensate for the greenhouse gas emissions caused by personal air travel. Many companies offer carbon offsets as an up-sell during the sales process so that customers can mitigate the emissions related with their product or service purchase (such as offsetting emissions related to a vacation flight, car rental, hotel stay, consumer good, etc.). In 2008, about $705 million of carbon offsets were purchased in the voluntary market, representing about 123.4 million metric tons of CO2e reductions. AAU - Assigned Amount Units - A tradable 'Kyoto unit' or 'carbon credit' representing an allowance to emit greenhouse gases comprising one metric ton of carbon dioxide equivalents calculated using their Global Warming Potential. Assigned Amount Units are issued up to the level of initial "assigned amount" of an Annex 1 Party to the Kyoto Protocol. Assigned amounts are the Kyoto Protocol Annex B emission targets (or "quantified emission limitation and reduction objectives") expressed as levels of allowed emissions over the 2008-2012 commitment period. An AAU or its near-equivalent European Union Allowance (EUA), may have a different market value to an offset such as a CER. This is due to the lack of a developed secondary market for CERs, a lack of homogeneity between projects which causes difficulty in pricing, as well as questions due to the principle of supplementarity and its lifetime. Additionally, offsets generated by a carbon project under the Clean Development Mechanism are potentially limited in value because operators in the EU ETS are restricted as to what percentage of their allowance can be met through these flexible mechanisms. Additionality - Addresses the question of whether the project would have happened anyway, even in the absence of revenue from carbon credits. Only carbon credits from projects that are "additional to" the business-as-usual scenario represent a net environmental benefit. Carbon projects that yield strong financial returns even in the absence of revenue from carbon credits; or that are compelled by regulations; or that represent common practice in an industry are usually not considered additional, although a full determination of additionality requires specialist review. AE - Applicant Entity - An entity that has applied for accreditation and designation as a designated operational entity (DOE) under the CDM, before its application has been finalized. A/R Project - CDM Afforestation and Reforestation Project. Afforestation is the process of creating forests on land that was previously unforested, typically for longer than a generation. Deforestation, particularly in Brazil, Indonesia and parts of Africa, account for about 20% of greenhouse gas emissions. Deforestation can be avoided either by paying directly for forest preservation, or by using offset funds to provide substitutes for forest-based products. 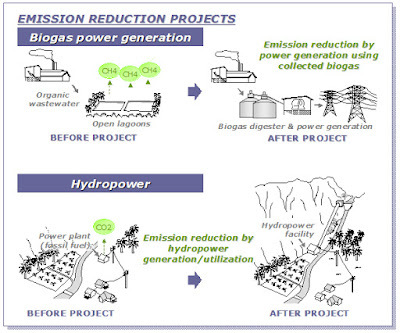 the volume of additional greenhouse gas emission reductions achieved by a project activity. CDE - Carbon Dioxide Equivalency - A quantity that describes, for a given mixture and amount of greenhouse gas, the amount of CO2 that would have the same global warming potential (GWP), when measured over a specified timescale (generally, 100 years). Carbon dioxide equivalency thus reflects the time-integrated radiative forcing of a quantity of emissions or rate of greenhouse gas emission - a flow into the atmosphere - rather than the instantaneous value of the radiative forcing of the stock (concentration) of greenhouse gases in the atmosphere described by CO2e. 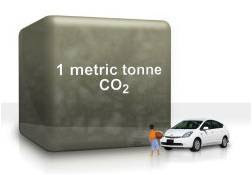 By the UN climate change panel IPCC: billion (giga) metric tonnes of CO2equivalent (GtCO2eq). For vehicles: grams of carbon dioxide equivalents / kilometer (gCDE/km). CO2E - Equivalent Carbon Dioxide - The concentration of CO2 that would cause the same level of radiative forcing as a given type and concentration of greenhouse gas. Examples of such greenhouse gases are methane, perfluorocarbons and nitrous oxide. CO2e is expressed as parts per million by volume, ppmv. CDM - Clean Development Mechanism - One of the "flexibility" mechanisms defined in the Kyoto Protocol (IPCC, 2007). It is defined in Article 12 of the Protocol, and is intended to meet two objectives: (1) to assist parties not included in Annex I in achieving sustainable development and in contributing to the ultimate objective of the United Nations Framework Convention on Climate Change (UNFCCC), which is to prevent dangerous climate change; and to assist parties included in Annex I in achieving compliance with their quantified emission limitation and reduction commitments (greenhouse gas (GHG) emission caps). "Annex I" parties are those countries that are listed in Annex I of the treaty, and are the industrialized countries. Non-Annex I parties are developing countries. CER - Certified Emission Reductions - A type of emissions unit (or carbon credits) issued by the Clean Development Mechanism (CDM) Executive Board for emission reductions achieved by CDM projects and verified by a DOE under the rules of the Kyoto Protocol. CERs can be used by Annex 1 countries in order to comply with their emission limitation targets or by operators of installations covered by the European Union Emission Trading Scheme (EU ETS) in order to comply with their obligations to surrender EU Allowances, CERs or Emission Reduction Units (ERUs) for the CO2 emissions of their installations. CERs can be held by governmental and private entities on electronic accounts with the UN. Primary CERs - Although there is no standard definition, common understanding refers to Certified Emission Reductions that will be issued to a Project Participant in the underlying CDM project. Hereby the underlying purchase contract is custom tailored to match the specific project risks, which is also reflected in the pricing of these CERs. The higher the project risks the lower the purchase price. Such a transaction normally encompasses that the buyer is purchasing a future multi-year stream of CERs that will be issued annually directly into the Buyers holding account at the CDM Executive Board. Secondary CERs - Can be bought or sold based on a standard contract, similar to EU Allowances. Because the Seller or Buyer are investment grade companies, transactions for CERs can be executed without having to worry about any of the risks typically associated with CDM transactions. CERs are either long-term (lCER) or temporary (tCER), depending on the likely duration of their benefit. Both types of CER can be purchased from the primary market (purchased from original party that makes the reduction) or secondary market (resold from a marketplace). At present, most of the approved CERs are recorded in CDM Registry accounts only. It is only when the CER is actually sitting in an operator's trading account that its value can be monetized through being traded. By the end of 2008, over 4,000 CDM projects had been submitted for validation, and of those, over 1,000 were registered at the CDM Executive Board, and were therefore entitled to generate CERs. As of 23 March 2010, 2099 projects have been registered by the CDM Executive Board as CDM projects. IGES CDM Project Database These projects reduce greenhouse gas emissions by an estimated 220 million ton CO2 equivalent per year. There are about 4,000 projects yet to be certified. These projects would reduce CO2 emissions by over 2.5 billion tons until the end of 2012. However, the previous adoption rate suggests that only a fraction of these projects will be certified. Certification Regime - The certification regime describes the systems and procedures that are used to certify and register carbon offsets. Different methodologies are used for measuring and verifying emissions reductions, depending on project type, size and location. For example, the Chicago Climate Exchange used one set of protocols, while the CDM uses another. Gold Standard - A best practice methodology and a high quality carbon credit label for both Kyoto and voluntary markets. JI - Joint Implementation - One of three flexibility mechanisms set forth in the Kyoto Protocol to help countries with binding greenhouse gas emissions targets (Annex I countries) meet their obligations. JI is set forth in Article 6 of the Kyoto Protocol. Under Article 6, any Annex I country can invest in emission reduction projects in any other Annex I country as an alternative to reducing emissions domestically. In this way countries can lower the costs of complying with their Kyoto targets by investing in greenhouse gas reductions in an Annex I country where reductions are cheaper, and then applying the credit for those reductions towards their commitment goal. The JI has caused less concern of spurious emission reductions than the CDM because the JI takes place in countries which have an emission reduction requirement. Most JI projects are expected to take place in so-called "economies in transition," noted in Annex B of the Kyoto Protocol. Currently Russia and Ukraine are slated to host the greatest number of JI projects. The process of receiving credit for JI projects is somewhat complex. Emission reductions are awarded credits called Emission Reduction Units (ERUs), where one ERU represents an emission reduction equaling one ton of CO2 equivalent. The ERUs come from the host country's pool of AAUs. Each Annex I party has a predetermined amount of AAUs, calculated on the basis of its 1990 greenhouse gas emission levels. By requiring JI credits to come from a host country's pool of AAUs, the Kyoto Protocol ensures that the total amount of emissions credits among Annex I parties does not change for the duration of the Kyoto Protocol's first commitment period. Methane Collection and Combustion - Some offset projects consist of the combustion or containment of methane generated by farm animals by use of an anaerobic digester,landfills or other industrial waste. Methane has a global warming potential (GWP) 23 times that of CO2; when combusted, each molecule of methane is converted to one molecule of CO2, thus reducing the global warming effect by 96%. Willow Creek Dairy Farm is an example manages manure in orfer to limit GHG Emission. NAMA - Nationally Appropriate Mitigation Actions - Developing countries’ pledges which are aimed at achieving a deviation in their GHG emissions compared to business-as-usual trends by 2020. Annex II countries are a sub-group of the Annex I countries. They comprise the OECD members, excluding Turkey and those that were economies in transition (an economy which is changing from a centrally planned economy to a free market. in 1992. PoA - Program of Activities - (Also known as Programmatic CDM (pCDM)) - A new concept of CDM which is expected to enlarge the CDM opportunities through registering a program of activities instead of individual project activities. pCDM is developed aiming to enable the small but large number of projects to become CDM projects, which will activate the wide range of efforts to tackle with global warming issues. 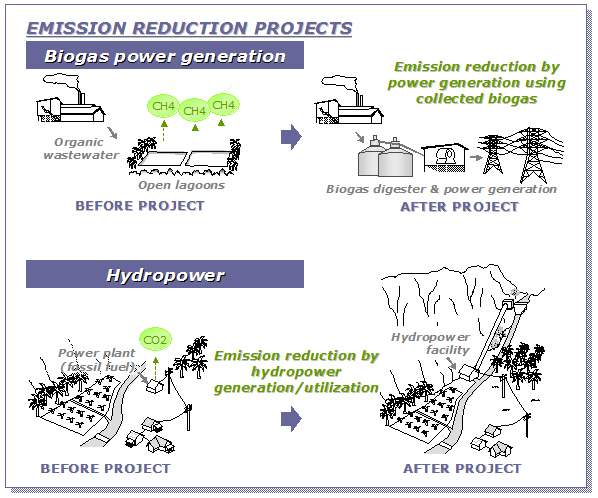 The aim of PoAs was to allow replicable projects with low and physically spread Greenhouse Gas reductions into the CDM. This type of project is often linked to higher sustainability benefits, but are too small to pay back the transaction cost involved in the CDM process. It was expected to allow African countries a higher participation in the CDM in particular. Under the PoA modality, a PoA Coordinating/Managing Entity (CME), which can be a government agency, NGO or business, develops a PoA which defines broad parameters for project activities (referred to as CDM Programme Activities or CPAs) that are eligible for inclusion in the PoA. Whereas stand-alone CDM projects must be approved individually by the CDM Executive Board, a PoA needs to be registered only once by the CDM Executive Board. After that, it can include an unlimited and unspecified number of individual CPAs without recourse to the CDM Executive Board. As of November 2010, after the 57th meeting of the CDM Executive Board, a total of 54 PoAs were under validation and 5 were registered. REDD - Reducing Emissions from Deforestation and Forest Degradation - A set of steps designed to use market/financial incentives in order to reduce the emissions of greenhouse gases from deforestation and forest degradation. Whose project boundary is within 1 km of the project boundary of the proposed small-scale activity at the closest point. Two different project activities will be considered to be applying the same technology if they provide the same kind of output and use the same kind of equipment and conversion process. Two different project activities will be considered to be using the same measure if they constitute the same course of action and result in the same kind of effect (e.g. two projects using the same management practice such as fuel switch). Supplementarity (Also known as "the supplementary principle") - One of the main principles of the Kyoto Protocol. The concept is that internal abatement of emissions should take precedent before external participation in flexible mechanisms like emissions trading, CDM and JI. VER - Voluntary Emission Reduction - The voluntary markets have always seen a mix of “pure voluntary” offsetting and pre-compliance motivations. Last year, suppliers reported that the bulk of transactions, around 70 percent, were driven by purely voluntary intentions. 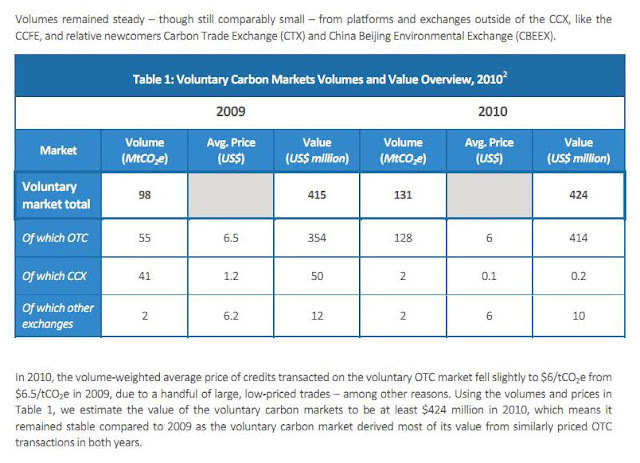 In 2010, suppliers reported a total volume of 131.2 MtCO2e transacted in the global voluntary carbon markets. Compared to the 98 MtCO2e transacted in 2009, volumes grew by 34% to exceed historic “over-the-counter” (OTC) and overall transaction volumes as tracked in our previous reports. As the global financial crisis gave way to recovery, voluntary buyers recommitted their discretionary income to offsetting emissions. At the same time, vastly different political circumstances in the US spelled the end of the CCX and shifted the majority of transactions to the OTC market. The OTC market last year transacted 127.9 MtCO2e, or 97% of global market share. Transactions collapsed on the CCX, which, due to the US Senate’s failure to secure a climate bill, ceased trading at the end of 2010. A single bilateral OTC transaction of CCX Carbon Finance Units (CFIs) totaling 59 MtCO2e substituted for collapsed exchange activity but will not likely be repeated. Even excluding this statistical outlier, OTC volumes were higher than in any previous year (68.7 MtCO2e). 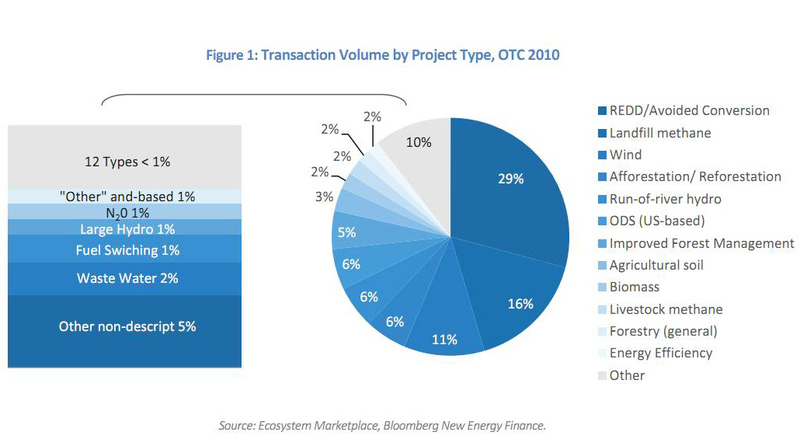 In 2010, primary Certified Emission Reductions (CERs) market, which accounts for the bulk of project-based transactions, fell by double digits for a variety of reasons, including lower demand for credits and competition from more predictable assets (Assigned Amount Units and secondary CERs). The CDM market is now at its lowest level since the Kyoto Protocol entered into force in 2005, having dropped by 46% to an estimated US$1.5 billion in new project-based transactions. Similarly, other carbon markets also declined or stayed at their plateau. Nevertheless, cumulatively, primary offset transactions have reached almost US$30 billion since 2005 and are expected to have catalyzed much larger resources, mostly from the private sector. In 2008, it cost European traders €31 to pump out a tonne of CO2 into the atmosphere, but today it will set you back about half that at €15. You will be hard pressed to find any financial wizard/pundit giving a sermon on a bullish carbon market in the near future- it’s just not happening anymore. The World Bank estimates total value of the 2010 global carbon market to be US$142 billion. The report’s authors noted that several reasons help to explain the decline, including the continuing lack of clarity about the market after 2012 and the loss of political momentum on setting up new cap-and-trade schemes in several developed economies. Some buyers from industrialized countries, which in previous years had reached or surpassed targets, consequently made fewer purchases in 2010. As well, lingering effects of the recession in several industrialized countries led to lower greenhouse gas emissions, easing emissions reduction compliance obligations. In 2010, the market volume and value of project based transactions fell by almost 50 percent from the previous year, to reach a total value of approximately $1.5 billion. The two-digit annual decline in the size of the market in the last three consecutive years (12 percent in 2008, 59 percent in 2009, and 46 percent in 2010) led the primary CER (pCER) market to its record low value since the entry into force of the Kyoto Protocol in 2005. Similarly, other carbon markets also declined or stayed at their plateau. Nevertheless, cumulatively, primary offset transactions have reached almost US$30 billion since 2005 and are expected to have catalyzed much larger resources, mostly from the private sector. Primary CER transactions, which used to represent a significant portion of the global carbon market in previous years (up to 23 percent of the market in 2005 and 19 percent in 2006), account for barely 1 percent of the global market today. from Phase III will limit even further the number of CERs eligible for compliance in the EU ETS. A large portion of the CERs currently being issued are from these project types—407 million out of the 605 million CERs issued to date (67 percent). carbon market refocused from federal legislation to California’s cap-and-trade. Between January and July, prices for offset credits in the United States were driven by the signals from federal legislation of whether the credit was likely to be eligible for an anticipated federal cap-and-trade program. Between August and October, the market was mostly illiquid, but in November it was reawakened by the release of California’s cap-and-trade regulation. The Climate Reserve Tonnes (CRTs) issued by the Climate Action Reserve (CAR) were the first choice for sourcing early action credits in the federal bills that came through the 111th Congress, including the Waxman-Markey climate bill that passed the House of Representatives in the summer of 2010. Average prices lingered from January 2010 to July 2010 at $5.90/t for national forestry vintage 2009 CRTs, at $3.50/t for landfill gas vintage 2009 CRTs, and at $4.20/t for V11-12 CRT forwards from ozone depleting substance (ODS) projects. As Proposition 23 was voted down in November and the market gained confidence in the California cap and-trade scheme, the price for CRTs from U.S. forestry, livestock methane, and ODS projects converged into one “CARB eligible CRT” price at an average of $7.00/t, jumping approximately 40% by January to an average of $9.75/t. In February and March 2011, on the back of the court case of “Association of Irritated Residents v CARB” and market’s concern with the invalidation of CRT prices were once again down by approximately 17% to average of $8.10/t. CARB eligible CRT prices are expected to stay at this level until further developments in the court case. The sources of funding are not yet clear. It is expected, however, that a portion of the $100 billion will come from private sources, which may be mobilized through carbon markets. Carbon finance and other financial instruments will be important for leveraging these funds to scale up the financing of mitigation and adaptation activities. Policy makers will need to ensure that market-based capacity is maintained in both the public and private sectors to ensure mobilization of the pledged climate finance. Voluntary Market - While the volumes in the VCM remain miniscule, less than 0.3 percent of the global carbon markets, overall transaction volumes increased 28 percent between 2009 and 2010 . The global economic crisis that dampened demand for voluntary climate action in 2009 gave way to market growth as buyers sought credits from projects that reduce emissions from deforestation and forest degradation (REDD. In 2010, suppliers reported a total volume of 131.2 MtCO2e transacted in the global voluntary carbon markets. Compared to the 98 MtCO2e transacted in 2009, volumes grew by 34% to exceed historic “over-the-counter” (OTC) and overall transaction volumes as tracked in our previous reports. As the global financial crisis gave way to recovery, voluntary buyers recommitted their discretionary income to offsetting emissions. At the same time, vastly different political circumstances in the US spelled the end of the CCX and shifted the majority of transactions to the OTC market. The OTC market last year transacted 127.9 MtCO2e, or 97% of global market share. Transactions collapsed on the CCX, which, due to the US Senate’s failure to secure a climate bill, ceased trading at the end of 2010. A single bilateral OTC transaction of CCX Carbon Finance Units (CFIs) totaling 59 MtCO2e substituted for collapsed exchange activity but will not likely be repeated. Even excluding this statistical outlier, OTC volumes were higher than in any previous year (68.7 MtCO2e). The CDM & JI have reduced over 600MtCO2e of emissions and may achieve 3.3 billion tCO2e by end 2020. There is now an established international market that penalises emissions and rewards reductions via prices that respond in real time to a changing world. The use of market mechanisms can contribute to lower the cost of achieving sustainable goals, result in additional resources, and send a price signal to encourage less carbon-intensive lifestyles and investment decisions. Subjectivity of Additionality - Addresses the question of whether the project would have happened anyway, even in the absence of revenue from carbon credits. Only carbon credits from projects that are "additional to" the business-as-usual scenario represent a net environmental benefit. Carbon projects that yield strong financial returns even in the absence of revenue from carbon credits; or that are compelled by regulations; or that represent common practice in an industry are usually not considered additional, although a full determination of additionality requires specialist review. To avoid giving credits to projects that would have happened anyway ("freeriders"), rules have been specified to ensure additionality of the project, that is, to ensure the project reduces emissions more than would have occurred in the absence of the project. At present, the CDM Executive Board deems a project additional if its proponents can document that realistic alternative scenarios to the proposed project would be more economically attractive or that the project faces barriers that CDM helps it overcome. Current Guidance from the EB is available at the UNFCCC website. HFC-23 Controversy - Hydrofluorocarbon-23 is a potent greenhouse gas (GHG) and an unwanted by-product in the production of HCFC-22, a refrigerant and temporary substitute to CFCs. HCFC-22 is both an ozone depleter and potent greenhouse gas and is being phased out under the Montreal Protocol. While there are only a handful HFC-23 destruction projects in the Clean Development Mechanism (CDM) they account for about half of all the CDM credits that have been issued so far. delivering any development benefits, credits from this project type have flooded carbon markets. None of the HFC-23 projects are located in Least Developed Countries. Montreal Protocol and are seriously compromising climate mitigation goals: Estimates show that the destruction of HFC-23 costs as little as €0.17 per tonne of CO2e but the resulting credits can be sold for up to €12, some 70 times more than it costs to destroy the gas. In addition, the current HFC-23 destruction methodology (AM0001) has major loopholes that enable plants to over-produce HCFC-22 and HFC-23. The resulting exorbitant profit margins of these projects create a strong disincentive to shut down plants in the course of the planned HCFC-22 phase out under the Montreal Protocol. The scale of the profits generated from CDM credits could have made it profitable to build whole new facilities just for the value of destroying the by-product. The initial reductions of industrial gas projects included large contributions from South Korea and Brazil, which were then followed by India and China. In response to this, the CDM Executive Board revised crediting to reduce the risk of perverse incentives. Critics of the CDM have stated that it would cost only €100 million to pay producers to capture and destroy HFC 23 compared with €4.6 billion in CDM credits, yielding what they believe are excessive profits to the sellers and middlemen. Carbon Trust argued that criticizing the CDM for finding low-cost reductions seemed perverse. They also argued that addressing the problem with targeted funding was easy with hindsight, and that before the CDM, these emission reduction opportunities were not taken. The scale of profits generated by HFC-23 projects also threatened distortions in competitiveness with plants in industrialized countries that had already cleaned up their emissions. In an attempt to address concerns over HFC-23 projects, the CDM Executive Board made changes in how these projects are credited. According to the Carbon Trust, these changes effectively ensure that: the potential to capture emissions from these plants is exploited; distortions are reduced; and the risk of perverse incentives is capped. Industrial gas projects, like those limiting HFC-23 emissions, are expected to contribute 20% of the CDM reduction in emissions to 2012. In mid-2010 the CDM Executive Board temporarily halted issuance of Certified Emission Reductions (CERs) from hydrofluorocarbon (HFC-23) projects over baseline concerns. As concerns revealed not to be substantiated, issuance resumed at the end of the year. Nonetheless, the European Commission soon thereafter proposed qualitative restriction in the EU ETS of carbon offsets related to CDM industrial gas projects. The proposal was adopted by the European Member States, which in January 2011 confirmed the ban of CERs from HFC and nitrous oxide (N2O) adipic acid projects starting, in 2013. A promising solution would be to simply pay for the costs of HFC-23 incineration in all HCFC-22 production plants in developing countries. The ideal implementing body for this action would be the Montreal Protocol on Substances that Deplete the Ozone Layer, which currently regulates the production of HCFCs. Its long history of successful technology transfer within this field means that it could simply use its existing compliance network to effect this transition. Carbon trading has become so essential to companies like Gujarat Fluorochemicals Limited, which owns a coolant plant in this remote corner of Gujarat State in northwest India, that carbon credits are listed as a business on the company Web site. Each plant has probably earned, on average, $20 million to $40 million a year from simply destroying waste gas, says David Hanrahan, the technical director of IDEAcarbon, a leading carbon market consulting firm. He says the income is “largely pure profit.”And each plant expects to be paid. Some Chinese producers have said that if the payments were to end, they would vent gas skyward. Such releases are illegal in most developed countries, but still permissible in China and India. Coal Plant Controversy - In July 2010, the Guardian reported that 12 companies have applied to the UN for hundreds of millions of emission reduction credits to subsidise "efficient" coal-fired power stations in China and India. Many of the plants would be paid for with carbon offsets bought by British and European companies in lieu of cutting their own emissions, effectively channeling billions of pounds of public money to giant energy companies to build 20 polluting coal-fired power plants on the basis that they will emit less carbon dioxide than older ones. If, as expected, the power company applications are approved by the UN Framework Convention on Climate Change (UNFCCC), they will earn around £3.5bn at current carbon market prices, making the UN body set up to promote clean energy and reduce global climate emissions one of the world's largest provider of funds for new coal burning instead. Offset Scams - Carbon offsets are difficult to measure, but they are worth real money. The incentive to cheat will be in the billions of dollars. In addition to the “carousel” value-added tax (VAT) fraud that surfaced in 2009, the last 18 months witnessed the sale of recycled CERs, phishing attempts on Germany’s national registries and a series of subsequent cyber-thefts that undermined the European market, highlighting security shortcomings and increasing the urgency of stakeholders’ pleas to strengthen infrastructure. High Administrative Costs - Less than 30 percent spent on some carbon offset schemes goes directly to projects designed to reduce emissions. The figures reported by the BBC and based on UN data reported that typically 28% goes to the set up and maintenance costs of an environmental project. 34% goes to the company that takes on the risk that the project may fail. The project's investors take 19%, with smaller amounts of money being distributed between organisations involved in brokering and auditing the carbon credits. 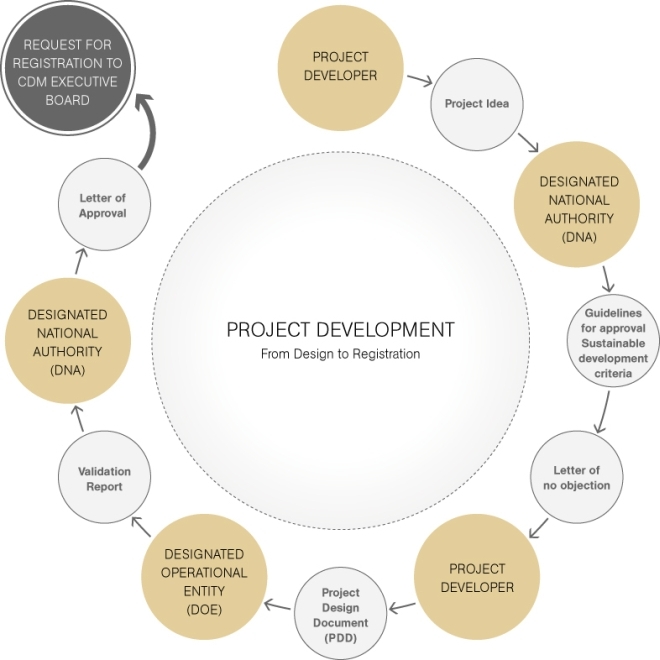 The classical structure of CDM uses a project-by-project process for registering and verifying projects. This approach involves very high transaction costs, a long time to market, and a high risk of non-registration. It is also very difficult to implement such a process in least developed countries and small island states where average project sizes and the scale of national markets tend to be smaller, so relative transaction costs are higher. In order to reduce transaction costs in CDM and expand the mechanism’s applicability to micro project activities, the CDM Executive Board launched the Programme of Activities modality. The major area of improvement and reform of the CDM is arguably the introduction of standardized baselines and monitoring methodologies. These decisions are aimed at maintaining environmental integrity, but reducing transaction costs, enhancing transparency and redictability, and facilitating access to underrepresented project types and regions. Carbon Market Fraud - Exchanges after reports of stolen carbon credits created safety messures to make the SPOT trading safe. In April 2011, Bluenext announced a Safe harbour initiative. In March 2011, Commodity Exchange Bratislava opened the Suspicious carbon credits registry. SCC Registry asks emitters to report the stolen credits as soon as possible. January 2011—Discovery of an EU ETS-wide theft of €45 million worth of EU allowances leads to the closure of national carbon registries, the suspension of spot trade, and the implementation of an EU-wide upgrade of registry security. November 2010—Incident of unauthorized access to EU ETS registry accounts in Romania results in the theft of 1.6 million EUAs. November 2010—German Registry closes due to Trojan virus Nimkey. March 2010—Hungary sells CERs that had already been surrendered to it under the EU’s emissions trading scheme. In response, the EU amends the registry regulations to prevent CER recycling. September 2009—European Commission proposes measures for a consistent response to deal with VAT or carousel fraud detected in the market in 2009–10. January 2009—The widespread phishing attacks on users of EU ETS registries prompts the EU to revise Internet security guidelines. Money Laundering -transactions that are undertaken to hide the true sources of the money. Usually the money involved is earned from illegal sources and is laundered to give the appearance of coming from a legitimate source. A speculation and concern of carbon market participants is that money laundering exists in the market. This speculation is based on the ease of transfer of allowances between registry accounts held in different countries, while avoiding mandatory reporting requirements, because no threshold reporting limits are triggered. However, at the time of writing the authors are unaware of any substantiated cases of money laundering. The EC plans to address money laundering and other issues as part of a wide-ranging review of the market oversight framework of the EU ETS. Inaccurate Biofuel GHG Accounting - Under international accounting rules significant emissions from bioenergy are not being accounted for, meaning that bioenergy is not fulfilling its potential as a climate mitigation tool and in some cases emits more carbon than fossil fuels. According to existing IPCC guidance, greenhouse gas emissions from bioenergy are not counted as emissions in the energy sector. Rather, the guidance assumes that bioenergy emissions will be reflected in accounting in the Land Use, Land Use Change and Forestry (LULUCF) sector. The guidance therefore relies on the assumption that emissions associated with the production of biomass energy feedstocks are accurately accounted for by the country of origin in its sector of origin i.e. the LULUCF sector. However, in the first commitment period of the Kyoto Protocol, accounting for emissions and removals from land management activities in the LULUCF sector is voluntary for Annex I countries. These activities are: forest management, cropland management, grassland management, and revegetation. Of these, forest management and cropland management activities lead to the production of bioenergy feedstocks. Indulgence Controversy - Some activists disagree with the principle of carbon offsets, likening them to papal indulgences, a way for the guilty to pay for absolution rather than changing their behavior. George Monbiot, an English environmentalist and writer, says that carbon offsets are an excuse for business as usual with regard to pollution. Opponents hold that the indulgence analogy is flawed because they claim carbon offsets actually reduce carbon emissions, changing the business as usual, and therefore address the root cause of climate change. Indirect Offsets - Renewable Energy Credits (RECs) are also sometimes treated as carbon offsets, although the concepts are distinct. Whereas a carbon offset represents a reduction in greenhouse gas emissions, a REC represents a quantity of energy produced from renewable sources. To convert RECs into offsets, the clean energy must be translated into carbon reductions, typically by assuming that the clean energy is displacing an equivalent amount of conventionally produced electricity from the local grid. This is known as an indirect offset because the reduction doesn't take place at the project site itself, but rather at an external site. Some controversy surrounds the question of whether they truly lead to "additional" emission reductions and who should get credit for any reductions that may occur. Ways to improve the access of under-represented regions in the CDM are particularly important in the face of the EU’s decision to restrict CERs from CDM projects registered after December 31, 2012 to those generated by projects located in least developed countries (LDCs). A significant change is needed in order to be able to scale up the virtual absence of LDC projects from the CDM pipeline. more revenue for financing reductions in developing countries. Because only actions that go beyond a previously defined threshold or target are credited, this would ensure net benefits to the atmosphere. Sectoral mechanisms and the CDM could co-exist but the CDM should increasingly focus on less developed countries, where it should continue to target low cost options for saving emissions. For the major emerging economies in the developing world, the CDM should gradually be replaced by new sectoral mechanisms. Mexico CFL PoA - To deploy 30 million compact fluorescent light bulbs (CFLs) in Mexico was approved in 2009. Under the project designed by energy efficiency project developer Cool nrg, the CFLs will be distributed in phases over the next two to three years with the aim of generating up to 7.5 million CERs. Dutch firm Eneco Energy Trade B.V. has agreed to buy the CERs in a deal brokered by TFS Green. Spot CERs traded at around 12.95 euros a tonne on Monday. The Mexico project plans to have 30 CDM program activities, to ensure full deployment of the 30 million CFLs. Strict monitoring of households and limiting the number of CFLs to each home were key parts of the design. Each household would receive four CFLs, and details such names and addresses and utility bill numbers taken for tracking. People also need to bring four old incandescent bulbs and exchange them, so this creates a barrier to stockpiling CFLs, As part of the ongoing monitoring, a sample of households is surveyed to see the proportion of CFLs that are in operation. California - In Dec 2010, CARB approved four U.S. based project types—urban forestry, forestry, livestock methane, and ODS—to generate offsets for California’s capand-trade system. In order to ensure supply of offsets at the start of the program in 2012, the legislation allows early supply of CRTs from the above listed project types with vintages 2005–14, as long as the project started prior to 2012. Offsets from jurisdictions under the Western Climate Initiative may also be accepted, but Certified Emission Reductions (CERs) from the Clean Development Mechanism (CDM) are not eligible. CARB’s regulations suggest a cumulative demand of 233 million tonnes of offsets from 2012 to 2020, or 8.7% of the total cap. To forecast supply, Thomson Reuters Point Carbon included projections from four project types CARB has approved. The projections also included REDD supply from Acre, Brazil and Chiapas, Mexico, and from U.S. based agricultural sequestration (cropland management and nutrient management), protocols for which CARB is likely to consider next for inclusion. The supply estimates show that there will not be enough offsets to meet the maximum theoretical demand in any of the scheme’s 3 phases, resulting in a cumulative offset shortage of 68Mt. In the wake of a lawsuit filed by environmental groups, California will delay enforcement of its greenhouse gas cap-and-trade program by one year to give the state more time fine-tune the scheme. The head of the California Air Resources Board (CARB) said in June 2011 that polluters wouldn't have to comply with the emissions trading program until 2013, but it would still begin in 2012. "We will be testing the system, doing simulation models, but no one will be held accountable during that year for compliance," CARB Chairwoman Mary Nichols told legislators Wednesday, ClimateWire reported. "But at the end of 2014, people will still be where they would have been if the program had started on time ." The initial 2013-2014 compliance phase covers only the electricity sector and large industrial facilities, such as oil refineries and cement manufacturers. Distributors of transportation fuels (including gasoline and diesel), natural gas, and other fuels are included in the second (2015-2020) phase. Ultimately 360 businesses representing 600 facilities will be covered under the program. Banking – Emissions allowances can be saved and used in later years, providing an incentive to take advantage of low cost-opportunities when they become available. Burtraw said that also should dampen price fluctuations from potential short-run fluctuations in emissions. and whether the project has achieved greenhouse gas emission reductions (verification. CAN - Climate Action Network, Washington, DC - A global network of over 700 NGOs in 95 countries working to promote government and individual action to limit human-induced climate change to ecologically sustainable levels. CCX - Chicago Climate Exchange- Was North America’s only voluntary, legally binding GHG reduction and trading system for emission sources and offset projects in North America and Brazil. CCX employed independent verification, included six greenhouse gases, and traded greenhouse gas emission allowances from 2003 to 2010. The companies joining the exchange committed to reducing their aggregate emissions by 6% by 2010. CCX had an aggregate baseline of 680 million metric tons of CO2 equivalent. The effective final CFI position was reached in November 2010 when the carbon credit price per metric ton of CO2 was between 10 and 5 US Cents, down from its highest value of 750 US Cents in May 2008. Trading reached zero monthly volume in February 2010 and remained at zero for the next 9 months when the decision to close the exchange was announced. Until July 2010, CCX was operated by the public company Climate Exchange plc, which also owned the European Climate Exchange (ECX). IntercontinentalExchange (NYSE: ICE), a leading operator of regulated global futures exchanges, clearing houses and over-the-counter (OTC) markets purchased Climate Exchange plc. in July 2010, followed by an announcement that half of the company's Chicago-based workforce would be laid off due to inactivity in the U.S. carbon markets. In November 2010, the Climate Exchange stated that it would cease trading carbon credits at the end of 2010, although carbon exchanges will still be facilitated. Designates operational entities that are provisionally accredited by the Executive Board. CDM-EB - CDM Executive Board - Approves CDM projects, certifies operational entities and will issue carbon credits for CDM projects. CDM-AT - CDM Assessment Teams - Ad hoc teams established to undertake assessments of applicant entities (AEs) seeking accreditation and designation. CDM- AT's prepare assessment reports of AEs for the CDM Accreditation Panel and conduct spot-checks of designated operational entities (DOEs) to ensure ongoing compliance with the CDM rules. CDM AT's are chosen by the CDM-AP according to the relevance of their experience in relation to the scope of the assignment and taking into account issues of consistency of assessment. DNA - Designated National Authority - The body granted responsibility by a Party to authorize and approve participation in CDM projects. Establishment of a DNA is one of the requirements for participation by a Party in the CDM. The main task of the DNA is to assess potential CDM projects to determine whether they will assist the host country in achieving its sustainable development goals and to provide a letter of approval to project participants in CDM projects. This letter of approval must confirm that the project activity contributes to sustainable development in the country. It is then submitted to CDM Executive Board to support the registration of the project. DFP - Designated Focal Point - Parties participatingin the Joint Implementation (JI) mechanism are required to nominate a DFP for approving projects. Validation: assessing whether a project proposal meets the eligibility requirements and subsequently request registration of the project by the CDM EB (validation). The registration will be considered valid after 8 weeks if no request for review is made. Verification/Certification: verifying emission reductions from a project, certify as appropriate, and recommend to the CDM EB the amount of Certified Emission Reductions (CERs) that should be issued. The issuance will be considered final 15 days after the request unless a request of review is made. Usually, for large scale projects, a DOE may only conduct either validation or verification of the same project. However, upon request, the CDM EB may allow a single DOE to perform both functions. Emission Markets - There are six exchanges trading in carbon allowances: the Chicago Climate Exchange (up to Dec 2010), European Climate Exchange, NASDAQ OMX Commodities Europe, PowerNext, Commodity Exchange Bratislava and the European Energy Exchange. At least one private electronic market has been established in 2008: CantorCO2e. Gold Stardard Foundation, headquartered in the BASE (Basel Agency for Sustainable Energy) offices in Basel, Switzerland, with offices in Geneva, Rome and San Francisco. (Wikipedia) - The world's only independent standard for creating high-quality emission reductions projects in the CDM, JI, and Voluntary Carbon Market. It was designed to ensure that carbon credits are not only real and verifiable but that they make measurable contributions to sustainable development worldwide. Its objective is to add branding, a label to existing and new Carbon Credits generated by projects which can then be bought and traded by countries that have a binding legal commitment according to the Kyoto Protocol. Revising the sections of the project design document (PDD) relating to baselines and monitoring. Including in the above assessments any policy issues of significant importance raised by the request for registration or issuance, for consideration by the Board. VSC Association, Washington, DC - An independent, non‐profit organization that manages the Voluntary Carbon Standard (VCS) is a quality standard for voluntary carbon offset industry. Based on the Kyoto Protocol's CDM, VCS establishes criteria for validating, measuring, and monitoring carbon offset projects. CDM Rulebook - The definitive online database of the CDM rules. It has been developed by Baker & McKenzie, with funding from eight donor organisations, and is now freely available to the public. Users new to the CDM should begin with the annotated Article 12 section or the Overview of the CDM. More experienced users can navigate directly to the relevant section, using the home page's flowchart, tabs or the search function. Ecosystem Marketplace/Bloomberg New Energy - State of the Voluntary Carbon Markets 2011 Molly Peters-Stanley, Katherine Hamilton, Thomas Marcello, and Milo Sjardin June 2011. Tracked a record volume of voluntary carbon credit transactions (131 MtCO2e) -- much of which consisted of private sector investments in forest conservation. In contrast, the World Bank's State and Trends of the Carbon Market 2011 report -- also released June 2011 -- revealed stagnation and uncertainty in the compliance markets, partly due to a lack of motivation among developed countries to pursue national market-based solutions.